The first edition was published in 2014 under ISBN 978-1-4302-6790-4 for the ebook and ISBN 978-1-4302-6791-1 for the softcover. The second edition can be found under ISBN 978-1-4842-3249-1 for the ebook and ISBN 978-1-4842-3248-4 for the softcover. Please make sure you are getting the second edition as a lot changed in three years. I have read way more programming books than I can remember. This is one of the best!! I’m a real person sat at the other end of the cable. I try to respond to as many messages as I can, but I’m not Ringo Starr. Please contact me if you have questions or comments. 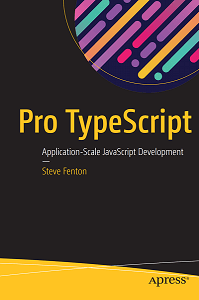 Here are the places you can buy Pro TypeScript, please let me know if you have other locations for me to add.